The Royal Doulton Gallery providing a brief look at some excellent examples of Doulton stoneware and porcelain art. Royal Doulton has been producing top quality products for a very long time and has employed, trained and developed some of the best British ceramic artists ever seen. It all started with a factory at Vauxhall Walk, Lambeth, London, as a partnership between John Doulton, Martha Jones and John Watts. The business initially specialised in making stoneware and produced decorative bottles and salt glazed sewer pipes before expanding production and producing superb pottery, porcelain, stoneware and china ceramics. 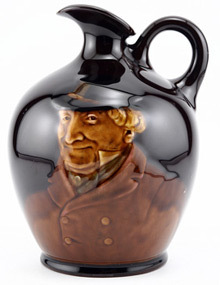 George Tinworth’s History of England Vase was one of the major pieces made for the Chicago World’s Fair. After the fair Tinworth rose to be recognised as the most notable artist of the early Doulton period and the most comprehensively represented artist. 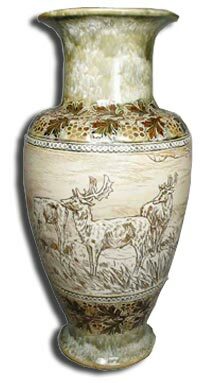 The History of England vase stands 52 5/8 inches tall and dates to 1872. Only two History of England vases are thought to have been made. 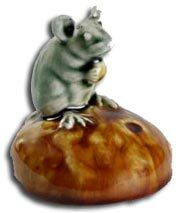 George Tinworth modelled mice either singly as paperweights and chessmen, or in groups that tell a story. A menu holder, for example, first produced at Doulton in 1885, is designed as an apple stall with the mouse attendant asleep while another quietly steals an apple. Tinworth produced these figures for light relief. They are mostly one-offs and there is little or no documentation for them. They are however, highly desireable and much sought after by collectors. 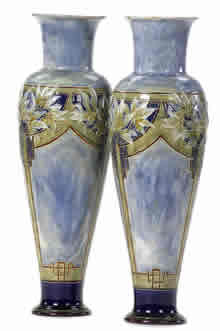 Francis Pope – Matched Pair of art Nouveau Vases. 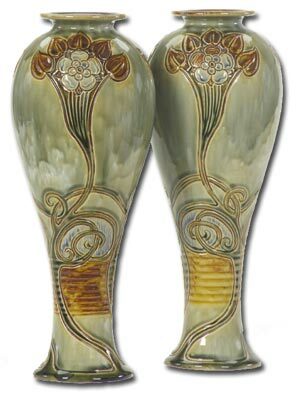 A Pair of Doulton Lambeth Art Nouveau Stoneware Baluster Vases by Francis C Pope. 19th century each incised and moulded with three upward swept and whiplashed multi-headed flowers against an olive green/white mottled glaze. Another rare one-off piece by George Tinworth depicting a scene from a public bath. Hannah Barlow, together with her sister Florence Barlow produced some of the most beautiful animal and bird studies ever seen on ceramic bodies. 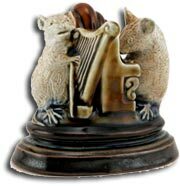 Both are highly sought after by Doulton collectors. Hannah mostly British animals and Florence mostly British garden birds. A single vase of significant proportion demonstrating the superb artistry produced by Hannah Barlow. Using the sgraffito method and depicting Hannah’s trademark band of wild animals in a naturalistic setting. Florence Barlow: A stunning stoneware ewer of large proportion depicting Florence’s trademark bird figures. Florence is now appreciated more and more for the stunning realism in her bird studies. 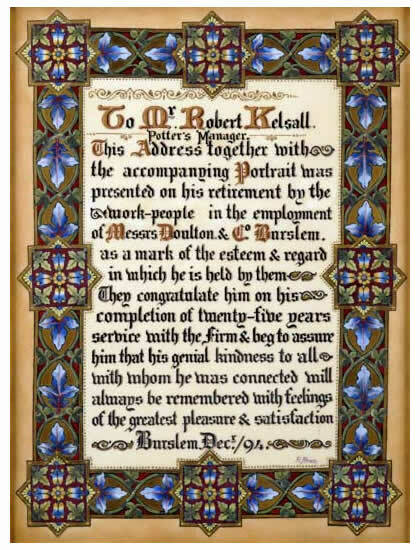 A Doulton & Co enamelled presentation plaque dedicated to Mr Robert Kelsall, the pottery manager. Inscribed within foliate carpet borders and highlighted in gilt. Both of slender tapered ovoid shape with trumpet necks, decorated with three slender trees whose stylised strapwork trunks begin near the foot and broaden into inverted arched panels enclosing flowering branches. Impressed lion & crown mark. Incised “ES 539”, and “P” within a shield. Sold on ebay for £1280 in 2007. Dogwood & Lilies in teal & brown colorway. Royal Doulton kingsware bottle, ‘The Huntsman’ designed by Charles J. Noke. Fox hunting, a popular pastime steeped in tradition dating back to the 16th century, originated in England to control the population of foxes considered pests to farmers. The hunt involves chasing down foxes using a pack of trained scenthounds while the hunter follows, usually on horseback. The hunter is typically clad in the traditional scarlet coat, dark breeches, and English dress boots. The traditional hunting cry ‘tally ho’ derives from the Norman French equivalent of ‘il est haut’ (he is up); ie. the stag has started running. The Royal Doulton Gallery … provides a small snapshot of just a few Doulton antiques and collectables. There are though, many specific types and ranges of Doulton collectables for the collector to focus upon. 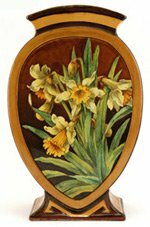 Doulton stoneware for instance, is a vast area for collectors and those interested would be well advised to concentrate their efforts on a specific artist or period rather than trying to collect something from every Doulton artist and period.